The Capital Barbie: It's So Fluffy! Let's talk texture. Sweater texture and material is critical for maximum comfiness but it also offers a third dimension to your outfit. Texture can create pattern or additional 'touch ability' to your top. You know what I mean. Similar to my all time favorite gif. 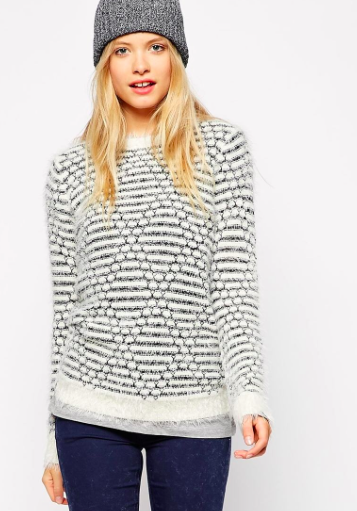 This sweater reminds me of a light dusting of snow and it looks so cozy. A blend of alpaca and merino means Lou and Grey is taking really good card of your comfort. 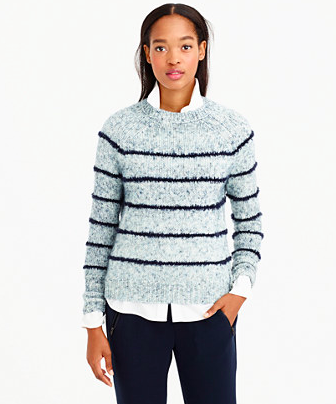 A preppy stripe option with a great ribbed neckline. 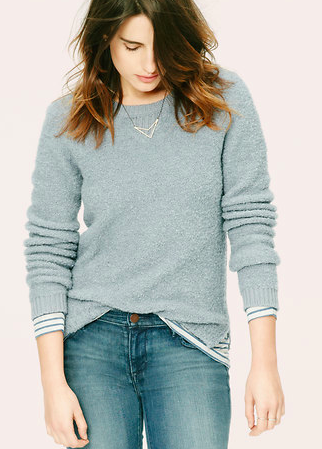 Oh this fine gauge sweater is so luxe. I also love the chiffon detailing, so unexpected. So if you're looking for cozy, you don't always need to look for cashmere. Try mohair, alpaca, and a fine gauge knit.